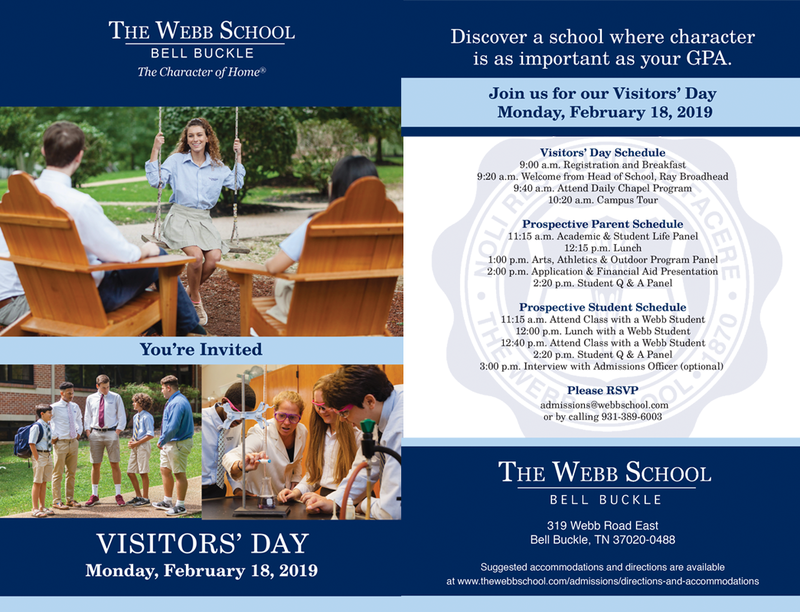 The Webb School will open its campus to prospective students and their families for a Visitor Day. The daylong event begins at 9 a.m. with registration and breakfast and concludes at 3 p.m. The schedule includes a tour of the 150-acre campus, led by a current Webb student. Visiting students will then attend lunch and class with a Webb student while parents attend informational panels regarding academics, financial aid and extracurricular programs. The day will conclude with a student Q&A panel for both visiting students and parents. Families are also invited to stay on campus for applicant interviews with an admissions officer. Those planning to attend are asked to RSVP by by emailing admissions@webbschool.com or calling 931-389-6003.